The quickest way to a lush and beautiful lawn is to install Arizona sod from West Coast Turf/Western Sod. An industry leader in innovative turfgrass developed specifically for the Arizona climate, West Coast Turf/Western Sod will help you find the right natural turfgrass sod for your area and planting season. Installing sod is the fastest way to enjoy a rich, green instant lawn. Seeding your lawn is more prone to erosion, planting sod requires less water than seeding, and sod is usually ready for “wear and tear” more quickly than seeded grass lawns. At West Coast Turf, our mature and hearty turfgrass is harvested daily and uniquely delivered to ensure that your sod is fresh and ready for installation. A nicely landscaped lawn immediately adds value to your home. These sod varieties are all hearty, rich in color and texture, and stand up to heavy use. Our experts at West Coast Turf/Western Sod can help you determine the best sod for your lawn. One of the best reasons to install sod in Arizona is that it can be planted any time of the year. Just be sure that your irrigation is ready before your natural turfgrass sod is delivered. 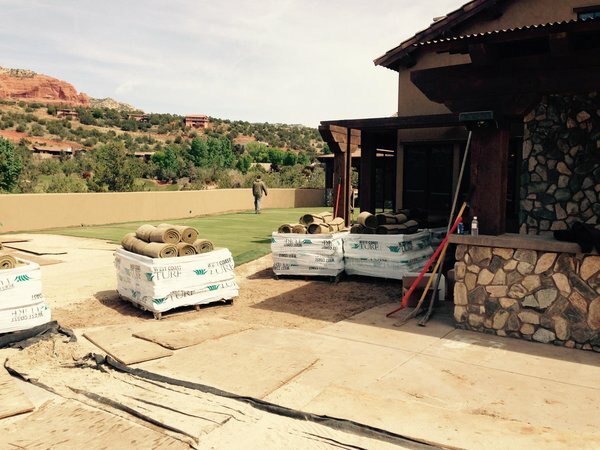 Preparation will make the process much easier, so we recommend following our Arizona Sod Installation Guide which provides tips on how to measure, prepare the soil, and literally how to roll out the sod for best results. Establishing and maintaining your sod is relatively easy. You should water your sod within 30 minutes of installation, and then maintain a regular schedule. Newly installed sod has special watering requirements to help establish deep roots to create a hearty, drought tolerant lawn. After just a couple of weeks, you can reduce watering. Keep in mind water needs differ depending on the season. For detailed information, follow our Sod Watering Guidelines. At West Coast Turf/Western Sod, customer service is our highest priority and we make it easy to order sod for Arizona. We have an office in Arizona; so you can visit, call us directly at 888-893-TURF or even buy sod online at www.westcoast turf.com. West Coast Turf/Western Sod turfgrasses are favored by architects, landscaper designers, homeowners and turfgrass professionals across the nation.